About four and a half years ago, I posted about my belief that warranties usually aren’t worth the money. Our sump pump had failed, and the company that had installed it charged me $850 to put in a new one. Had I paid $165 a year for the warranty and service visits, they would have replaced it for free, but by my math I still broke even. More importantly, I watched everything the tech did when he replaced the sump pump. It doesn’t look that complicated, now that I see how the pipes fit together. If it fails again, I think I might take a stab installing a much cheaper one from Home Depot myself now that I know what to do. Well, guess what? That sump pump just failed again. Time to put the theory to the test. So many years later, I had a vague memory of how the old sump pump was connected from watching the tech replace it last time. It should just be a simple matter of loosening the collar that held the pipe on, and then I should be able to remove the pump and put in a new one. First, I needed to actually get to the sump pump, which was covered with gardening supplies and other assorted basement items. After clearing them all away and removing the cover, I peered in to the dimly lit tank to find the pump and see how well it matched up with my memories. For tasks like these, I’ve found a very handy device… a neck mounted lamp called a HugLight. It’s a pair of LED flashlights mounted on a semi-flexible cord that you can bend to hold in place, either hooked around an object or around your neck. It let’s you keep both hands free but still have light right where you need it. Once I got in there, it was just as I remembered. I found the collar and with a screw driver I was able to disconnect and pull out the pump. Easy. Then, it was a trip to Home Depot. I found the sump pumps in the back, at a much more reasonable range of $100 to $250. I chose one for $230 because it looked the most similar to the one I had just removed. Also, the last time I did this, it cost me $850, so even the most expensive models would still be a substantial savings. Back at the house, I dropped the new sump pump in… and discovered that even though they looked similar, the pipe was a good 4-5 inches too short to reach the connector. Shoot, I hadn’t thought of that when I thought this would be so easy. So, here I was at the turning point… I could either call in a plumber, or I could keep trying to fix this myself. I really like our plumber (Tom Lanza, if you need someone in the Cambridge/Somerville area). The problem is that I would then need to juggle my schedule to arrange for him to come out. Also, I don’t mind paying a plumber for complex jobs, but I hate spending the money on something that is actually quite easy, if you just know the steps. I still felt like this shouldn’t be too hard, so I persevered. And so, back off to the Home Depot to see if I could find a connector. Sure enough, there was exactly such a device for connecting a sump pump to an existing drain pipe. It cost me another $25, but I was still way ahead. Then came the challenging part – with the connector, the pipe was now too long, so I would need to use a hacksaw to cut the old pipe down to size. I knew that if I messed this up, I would have to call in the plumber. With a deep breath, I made the measurement and then cut the pipe. Within a few minutes, I had attached the connector and then hooked in the sump pump. A quick test showed that it was able to successfully pump the water out. Success! At least I hope so… it will have to wait until the next major rain storm to find out if I did this properly. Without revealing any spoilers about the new Star Wars movie, I can safely say this… they have made great strides in creating strong female characters. While there were initial concerns about there being relatively few female characters in the lineup, seeing the movie puts the fears to doubt. Daisy Ridley’s Rey is a great leap forward. She’s definitely a character that both girls and boys can get excited about. Princess Leia was progressively strong for a female character as things stood back in the 1980’s, but she still needed a fair amount of rescuing. Rey, in contrast, breaks out into new territory and stands on her own as a heroic character. As a father with a daughter, I’m excited to see Star Wars send this message. Not that I’m taking my daughter to see the movie… she gets too scared to even see the original movies. However, she likes to hear about the story and it’s great to be able to tell her what a strong character Rey is. Unfortunately, it seems that the toy makers haven’t taken up the charge in the same way. One of the ways that the original Star Wars movie broke new ground was in their extensive merchandising tie-ins, particularly around the toys. Kids left the movie not wanting it to end, and the toys allowed them to keep playing the most exciting parts over and over. This is still true in 2015, and the market is absolutely flooded with Star Wars themed toys. Kylo Ren’s face is plastered everywhere, and there are all sorts of figures and vehicles. However, I’m sad to say that Rey is not well represented. My daughter was excited to hear about Rey’s strong character, and I thought it would be nice to get her a Rey figure to play with. I stopped off at a Toys R Us to see what was available. This close to Christmas, I expected the stock to be picked over, and sure enough it was. Kylo Ren and BB-8 were nowhere to be found, but there were plenty of other characters around. There were lots of Finn (the male lead) and Poe Dameron (the rebel pilot). And there were all sorts of other vehicles and figures. But not a single Rey. Now, it’s possible that all of the Rey figure were snapped up, leaving lots of Finns and Poes, but I’m doubtful. I followed the build up to the movie closely, and even I was surprised by what a strong character Rey turned out to be. While it’s possible that Rey was manufactured in equal numbers to the other characters, I’m skeptical. Finn and Poe were heavily cross-marketed in lots of items, but Rey was absent. I’m pretty sure that the toy makers figured that Star Wars figures were for boys, and they wouldn’t need to manufacture as many Rey figures. Thankfully, Amazon came to the rescue. While I couldn’t find an individual Rey figure, I did find a set of six figures that included Rey. The good news is that there are more movies coming out in the next few years. Hopefully Hasbro will get it right next time. With the holiday season now officially started and gift shopping in full swing, I thought I would take a moment to share a surprising book I stumbled across… a superhero book that is actually worth buying. Every time my son goes to the library, he comes home with a pile of easy readers about superheroes. As a kindergartener, he is only just starting to learn to read, but he is obsessed with these books and asks us to read them over and over. He has an amazing memory and will memorize them after just one or two times, but he will still insist that we read them at least a dozen times. And let me tell you… these are not the sorts of books that you want to read more than once. Granted, they are easy readers, so the bar is low, but still… it can be pretty painful at times. The stories are just awful. Don’t get me wrong. I love superheroes, and I am happy to encourage my kids’ interest in them. One of my favorite picture of my son was when I photoshopped him to look like the Incredible Hulk. And I think that it’s great how easy readers capitalize on kids’ interest in superheroes to build critical reading skills. But I still have to roll my eyes when a big stack of them comes home. They are just so painful to read. Which is why I was so surprised to find a superhero book I actually like. A few weeks ago, my wife and I took a kids-free getaway weekend to Chicago. While browsing shops in the West Loop, I wandered into one of those little boutiques that says all sorts of silly little gifts and jewelry. They had a section of children’s books, and I started to browse through them to look for some gifts for the kids. And so I stumbled onto the “DC Super Heroes: My First Dictionary“. Now if you are a parent, I’m sure you already rolling your eyes just based on the title. We’ve all seen endless books with names like this… “My First Book of Colors” or “My First Book of Trucks” and so forth. This book is different. It’s a book of 500 words. Some are generic (car, hat, etc.) and some are very superhero specific (can you spell “Batarang”?). Along with an example sentence, each picture is illustrated with a picture from the “silver age” of comic books. They are bright, fun, and colorful. It’s a joy just to thumb through the pictures. For my son, the book is a prized possession. He loves to look at the pictures and ask questions. All of the classic characters are in there, as well as a lot of the side kicks. Women feature prominently (Wonderwoman, Supergirl, Batgirl, and other lesser known female superheroes get lots of air time), and it also has lots of lesser known characters that I need to ask my own father about (who is Zantana?). Sometimes at bedtime, my son and I will read through two or three letter’s worth of definitions. It has high production values and is well put together. If you are going to spend money on a book for a kid who loves superheroes, this is one you can feel good about. While in theory it should be a 50/50 split, with traits evenly appearing from both parents, many times it feels like a child takes more after one parent than the other. In our family, we often joke that our seven-year-old daughter Ayelet takes after me, and our five-year-old son takes after my wife Aviva. Ayelet has my darker brown hair, and just like me, she is a total mess in the mornings. I solve this problem for myself with coffee, but she’s too young. I’ve seriously wondered whether we could start her on some sort of placebo in the meantime. Ayelet is also a total carnivore. 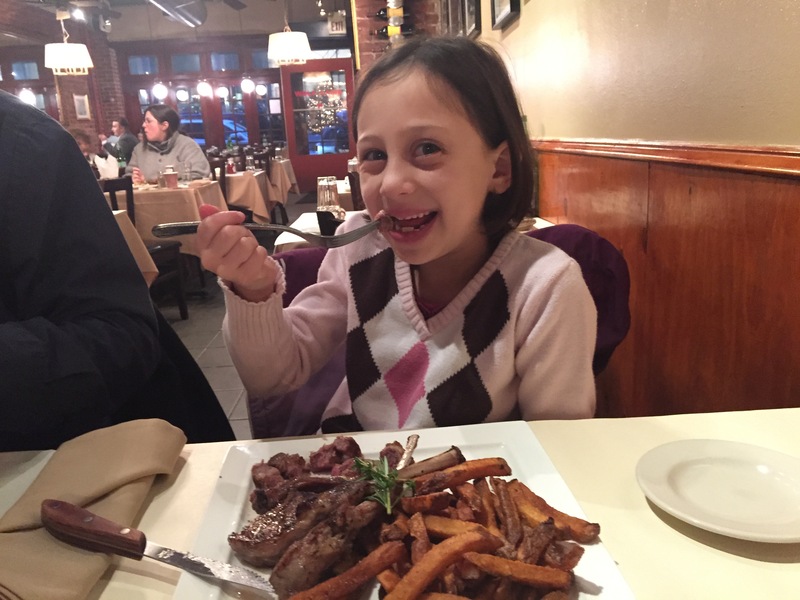 She loves meat in just about any form, and one of my favorite things to do is take her out for her favorite – lamb chops – when we find ourselves in New York City with access to kosher restaurants. Rafael, on the other hand, has my wife’s sandy brown hair, and he perks his head up at 6am, ready to go for the day. He hates being dirty and likes to keep everything organized and arranged just so. Unlike his sister, he refuses to eat any form of meat other than hotdogs. When I first met my wife, she was a vegetarian, although she has since grown to appreciate a nice buffalo steak. Of course, comparisons like this are silly, since I can point to lots of traits where Rafael takes after me and Ayelet takes after my wife. Just to name a few… Rafael can never remember anyone’s name and constantly refers to people by the wrong one, just like me. Ayelet is extremely social and loves to engage with people, just like my wife. And of course, there are traits that come from neither of us. They are both athletic and have taught themselves all kinds of crazy tricks on the monkey bars and rings. I sometimes joke that they might be the mailman’s kids. But still, some parallels are so strong they cannot be overlooked. Aviva and I have some very clear separation of duties in our family. I deal with vomit and broken glass. Aviva handles blood and clipping kids’ fingernails. I kill and dispose of any animal that enters our home or property that has four legs and under (basically, I kill any mice), and Aviva kills anything that has six limbs and higher (bugs and spiders are her job). The other night, I needed to rehang something on the wall and went down to the tool shelf at the bottom of the basement stairs to get a hammer. Ayelet had followed me down to chat about something and was standing a few steps from the top behind me. Suddenly, I heard my daughter scream with the most violent terror I have ever heard in my life. I was convinced that something horrible must have just happened to her – perhaps she had stepped on a nail or stabbed herself. I immediately turned around and gathered her in my arms and carried her back upstairs. She was sobbing uncontrollably. At the same time, my wife had bolted down from the second floor to see what terrible tragedy had befallen her. Between the sobs, we finally coaxed out of her what had happened. “I…saw…a… centipede!” she croaked. Yes, even in a house as clean as ours, there are some bugs living in the basement. Some of them have an obscene number of legs, although I don’t know that they are actually centipedes. They creep me out, but I accept the fact that they get to live in the basement where it’s dark. When a bug ventures upstairs, however, I’ve been known to screech, just like a little kid. Aviva has to come from wherever she might be in the house and dispose of it. Yes, Ayelet definitely takes after me. I’ve never seen kids move so fast. Kids went running off in terror in all directions. One jumped behind the couch. Another kid hid behind her father. A third ran for the corner. I saw Rafael bolt out of the corner of my eye towards to the kitchen. I sat there, considering what to do. Aviva was out of the house, so it was going to fall to me and my guest to dispose of the spider. Just as I was about to look closer to try to come up with a plan of action that might – heavens forbid – involve getting closer to the spider, Rafael came running back into the living room. He took a flying leap and sailed three feet to land with a resounding thud next to where the spider was. “I’ve got it!” he yelled, and with a tissue in his hand, slammed it down on the spider, squashing it. He scooped it up and then ran back to the kitchen to throw it in the trash. While every other kid had fled in terror, Rafael had immediately jumped into action. He wasn’t running away from the spider… he was running to the kitchen to get a tissue so that he could come back and kill it. He didn’t even miss a beat. Definitely Aviva’s son. I would never do that. One of the staples of my childhood growing up in the 80s was listening to Free To Be… You and Me on our Fisher-Price record player. While most of the songs revolved around creating an egalitarian society where boys and girls have equal opportunities and are treated the same, one of the songs that still stands out is “Helping”, about kids helping each other with all sorts of activities. This phrase comes out when one the kids decides to “help” with cooking or home repair or some other task. For example, I might be mixing some salad dressing when one of the kids jumps in wanting to participate. I just need a teaspoon of salt, but they want to pour and hold the spoon, and I find myself struggling to avoid a huge mess. A five minute task ends up taking 20, once you factor in the clean-up. Last weekend, I was finishing up putting together a fundraiser mailing for a non-profit organization I help out with. Over the course of a few days, I had printed and stuffed 140 envelopes. Now I just needed to seal them up and stick on the address labels and stamps. “Um, okay,” I said. Rafael is quite diligent, so I figured I could keep him occupied and get a head start on the mailing. The envelopes needed to be sealed. These are the easy self-sealing envelopes where you just pull off a wax cover and fold the pre-glued flap down. In theory, it shouldn’t be that hard, so I handed Rafael a stack of five envelopes and started sealing my own. “I’m ready for more!” he soon announced. I looked over, and sure enough, he had them all sealed up and ready to go. I handed him 10 more and he kept going. I was probably sealing 5x faster than him, but when all was said and done it did reduce the number of envelopes I needed to seal. The next step was to put the stamps and mailing labels. He was still eager to help, but now the job was more difficult. Placing stickers is more error prone and hard to fix if misplaced. I was torn between the stamps, which were simpler to place but cost money, versus the mailing labels which could be reprinted but larger and harder to orient. I took a gamble a handed him a roll of 100 forever stamps worth $49. 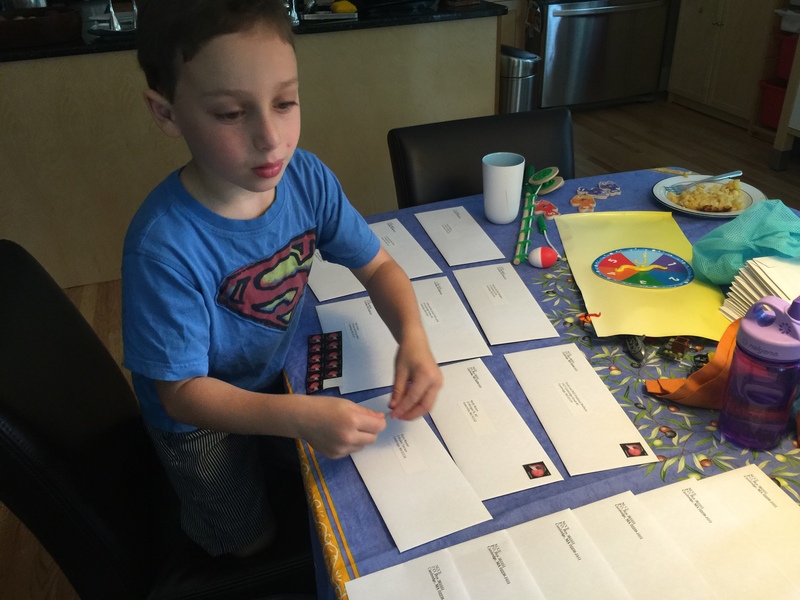 I showed him how to lay out several envelopes at once and where to put the stamps, and he got started. One after another, he placed the stamps in the right spot and was ready for the next set. I kept giving him more envelopes while I put on the labels as I worked next to him. Sure, I went faster, but he was doing a good job. At $0.49 a stamp, it was a little risky, but he did a good job. Within an hour, we got the whole job done. If I was working by myself, it probably would have taken me an hour and 20 minutes. It wasn’t a huge savings in time, but it was net positive. He was actually helpful. A few days later, I was making salad. I started peeling a carrot, and my seven-year-old daughter announced she wanted to do that. She has done this before, so I handed it over. However, when she was finished she announced she actually wanted to eat the carrot now that it was peeled. Oh well. I peeled another carrot and was about to start slicing it when Rafael suddenly jumped up and said that he wanted to cut it up. I looked at him, remembered the stamps, and said okay. Now, I must admit that handing over a cutting board, a knife and a carrot to a five year old takes some nerves, but he is a careful kid. I was confident he could handle it. When my daughter saw this, she lost all interest in eating her carrot and announced she wanted to cut a carrot too. Soon I had the two of them sitting with their own cutting boards, peeled carrots, and knives, chopping them up. Once I confirmed they were being careful and doing a good job, I turned my attention to making the rest of the salad. By the time they were done, I had the rest of the salad put together. Were the carrots cut perfectly? No. Some pieces were a little large, but overall they did well. I had them slice the larger pieces in half again, and then we dumped them into the salad. No one cut themselves, and I actually got to do work while they were cutting the carrots. The salad really was a team effort. Help that is actually helpful! This is a whole new world. Congratulations, Facebook… all of your hard work to appeal to casual users has been successful. I hardly look at you any more. And careful, Twitter… you are risking the same fate! I used to love Facebook. I found it a great way to keep up with the zeitgeist of what was going on in my community and far-flung friends. It was my window into popular culture was well as the ups-and-downs of people I care about. Several times a day, I would spend a couple of minutes scrolling through the timeline until I got to the posts I had already read. While the majority of posts are inane, tucked inside were some really important or interesting updates I didn’t want to miss. In the process, Facebook was able to show me a lot of ads. Most of them I ignored, but occasionally I would click on one. I even bought a few things… I’m thinking of you, Touch of Modern. However, Facebook went in a different direction. While people like me who wanted to see every post were great, they realized they were missing out on a lot of casual users. These are the users who might log in once every few days or just a few times a month, and if they didn’t see interesting posts, they probably wouldn’t come back. So they put more and more work into tuning their news algorithm. With their “Top Stories” view, they brought the most interesting, most liked, most commented on articles up to the top, out of order. Articles that your friend were commenting on could re-appear, rather than scrolling off in linear time. It’s perfect for casual readers who can come in, see the most important and exciting updates, and then leave. I didn’t like it, but fortunately, Facebook gave you an option. The News Feed could be in either “Top Stories” or “Most Recent”. I kept it on “Most Recent”. Annoyingly, every once in a while it would automatically switch back to “Top Stories” mode, but I would switch it again and everything would be fine. And so several months went by. At some point, however, Facebook decided that everyone should be using “Top Stories”, so they made “Most Recent” harder to get to for their mobile app, which is where I usually accessed it. Rather than just a setting in the News Feed, “Most Recent” became a hidden option buried in several layers of sub-menus. You could still get to it, but it was a lot more taps and a lot more annoying when it automatically reverted. I still stuck with it. Now, items would show up in my news feed over and over. Every time a friend clicked the like button on a post in my timeline, it would jump in. No new information, just the same article telling me now that “Joe” liked it. I found myself scrolling constantly threw articles I had already seen. Yes, it was “Most Recent”, but the chronological order was basically destroyed. In the end, I gave in. I decided that if Facebook really wanted me to use “Top Stories”, I would use it. And so, the decline in my Facebook usage began. Yes, when I went in, I had some very interesting and exciting posts right up top. But as I would scroll down, I would start seeing stuff I had already seen, followed by new stuff. I would see posts from three days ago, followed by a post from 20 minutes ago. I could never figure out if I had “caught up” on the news. Even more annoying, the out-of-order posts quickly became confusing. At the top of my feed, I would see a post from a two hour post from a friend saying something like, “Oh no! Our car broke down! Can anyone give our kids a ride to school?”, but three pages down, it would say, “Problem solved! Our neighbor gave the battery a jump.” Or posts would show up out-of-context, where a person is referring to another post they made a few minutes before, but it doesn’t show up in the feed and I have no idea what they are talking about. Gradually, I started using Facebook less and less. Nowadays, I try to remember to check it once a day. I will scan the top headlines before I go to bed, but it’s an afterthought. Nice job, Facebook. I’d say that I probably spend about 5% of the time using the service compared to what I used to do (some of you might argue that’s a good thing, but I miss the service). Twitter has also slowly been going down this path, although I have managed to hang on. I carefully maintain the list of people I follow, and I like to read every tweet. If someone tweets too much, I remove them. I consider it a vital source of information, particularly in the technology world, and sometimes a really important tweet will zip by. I want to make sure I have seen them all. The Twitter website makes this really hard. They have no concept of picking up where you left off. They have a section called “While you were away”, which tries to do something similar to Facebook’s “Top Stories”, showing you the tweets it *thinks* you will like the most, but I really want to see them all. If you keep the Twitter window open on your browser, it will keep track of how many tweets are new, but this is of limited use. You can’t switch from mobile to desktop and pick up where you left off, and if you have to reboot your computer, you start fresh. Fortunately, other twitter clients like Twitterific jumped into the gap. They wrote their own clients on top of the twitter API, and they included services like iCloud or Tweet Marker to track your place. You could move from one device to another, and your position would be maintained. Perfect. Unfortunately, Twitter has felt the need to meddle. A few years ago, they started limiting API usage by developer, trying to push everyone to use their own website and mobile apps (which don’t have any ability to mark your place). Twitterific had a desktop and a mobile client, but to make better use of their available API keys, they stopped updating the desktop client. It still works, but it hasn’t kept up with functional changes like inline images or quoted tweets. The mobile experience is excellent, and the desktop experience is poor. And the problem is, I don’t always want to use my mobile device to keep up on Twitter. One of the things I love about Twitter is the links to relevant technology related news articles, and it is much more pleasant to read these on a desktop browser. I was getting close to giving up until I discovered a new client, Tweetbot. I was always vaguely aware of them, but their apps were much more expensive ($4.99 for the iOS client, $12.99 for the desktop client). However, it looks like the higher cost has reduced their API usage, so they have actually continued to invest in their desktop client. It supports all of the latest features, and it perfectly hands off my reading position between my mobile devices and desktop client. So, I’m still hanging on with twitter, thanks to Tweetbot. I loved Twitterrific, but their inability to provide a satisfying desktop experience lost me as a user. I know Facebook and Twitter are carefully measuring their active engaged user counts, and they need the casual users to keep their numbers growing. But couldn’t they do it without sacrificing functionality for their more active users? For the past 17 years, I have been regularly ordering flowers from the same florist. I send my wife Aviva flowers in September on our wedding anniversary, in October on her birthday, and in November on the anniversary of our first date. It’s like clockwork. At this point, the florist knows me when I call. It’s a small, independent shop called B&G Sawin Florist, named for its owners Barbara and George. They keep my information on file. They used to ask what I wanted, but I would always just tell them that I trust them and they should just use their judgement. We’ve been doing it for so long now, they know what to expect. I started ordering them when Aviva and I were newly married, and I wanted to send flowers to her at work for her birthday. I had never needed a florist before, so I didn’t know where to start. I figured it would make sense to order from a florist near her office, so I looked online (from yellowpages.com – Yelp didn’t exist yet) and found one down the block called B&G Sawin Florist. And so I placed an order. A month later, when I wanted to send her flowers again, I figured they had done a good job (at least according to my wife) and placed another order. And then again the following September for our anniversary, and on and on. My wife always liked what they did, so I saw no reason to switch to anyone else. Since my order would never change, the amount I spent never changed either. “What did you have in mind?” George would always ask. “Something in the $50 range,” I would always reply. Aviva and I have been both working flat out recently, and it occurred to me that it might be nice to send her flowers out of the blue. So, I called up B&G Sawin florist as usual, and placed an order with George. $75? $100? I was speechless for a moment. I always ordered $50. Had I been spending too little all these years? Not sure what to do, I finally blurted out, “Um…$75.” He finished writing up the order, and we were done. 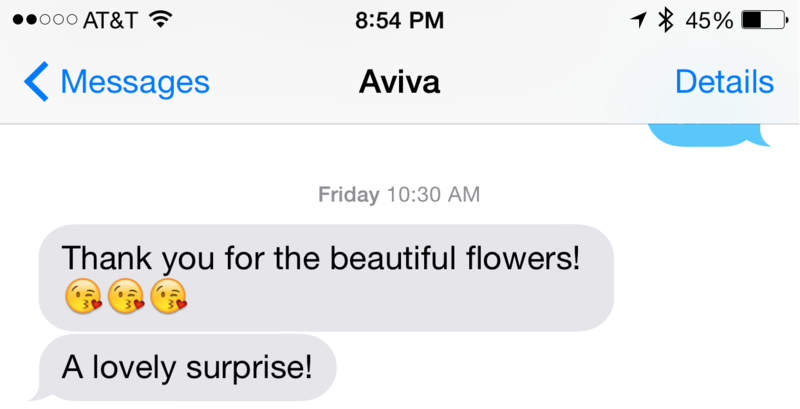 90 minutes later, I received a very surprised and excited text from Aviva, thanking me for the flowers. 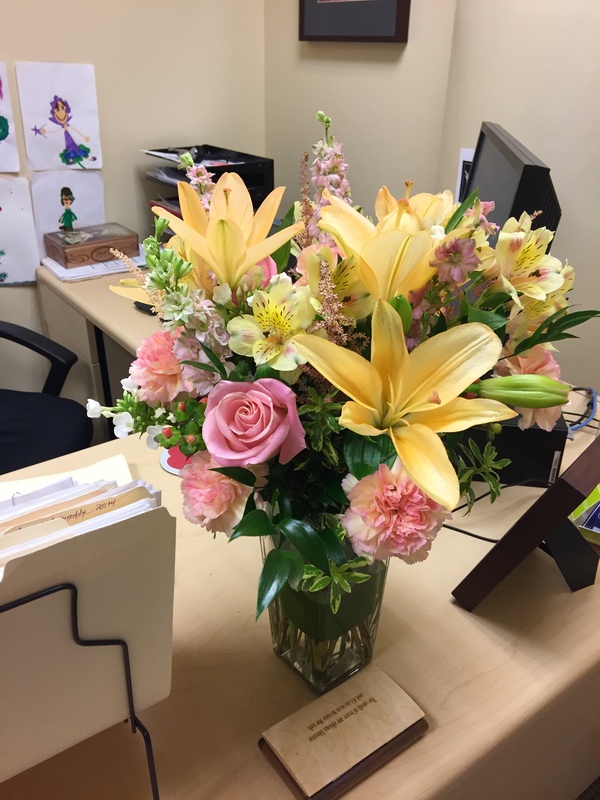 The next day, I took an informal poll with the other men in the office to see how much they paid when sending their spouses flowers. While they both immediately responded that they hadn’t done it in a while, one said $50 and the other said $75. So, I don’t think that I was necessarily going to too low previously, but clearly there was room to go up. I asked my wife if she noticed the difference between $50 and $75, and she definitely did. Not only was the arrangement larger, but the types of the flowers were more impressive. The $50 arrangements were beautiful and she loved them, but she could definitely tell the difference. Well, I’m certainly not going back to $50 arrangements now. Clearly it is going to be $75 going forward. This is a 50% revenue increase from a recurring customer, all from just a well-timed upsell. Clearly, George should have done that years ago.